Android 7.1 launched with the new Pixel phones and became available in beta form for the Nexus 5X and 6P not too long ago, but many apps are already introducing support for the new features that 7.1 brings. 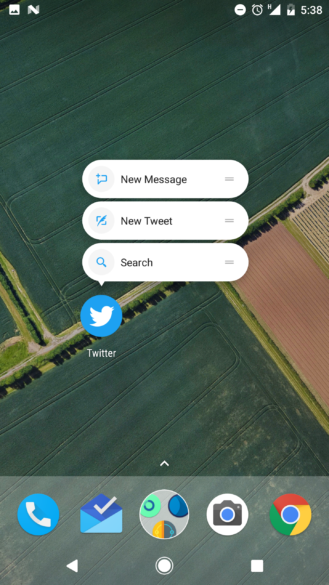 With its newest alpha build, Twitter has become the latest app to do so by adding support for app shortcuts and a round app icon. This build also enables multi-window for devices running 7.0 Nougat+. Us Pixel-less peasants will still have to deal with the square icon. The app shortcuts (also called launcher shortcuts by some) that Twitter has instilled are 'Search,' 'New Tweet,' and 'New Message.' Their functions are pretty self-explanatory, I'd like to think. As with all app shortcuts, they can be put on the home screen by long-pressing and dragging them over. These may come in handy for those of you heavy tweeters. 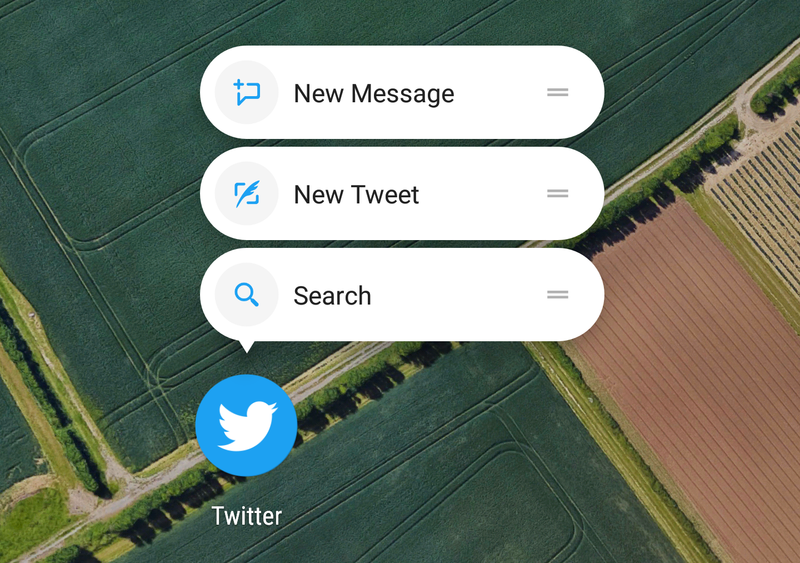 left: A round Twitter icon, as seen on a Pixel XL. 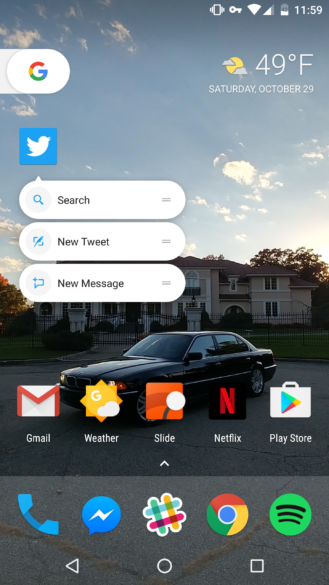 right: Multi-window. If you can't see the new, circular icon on your device, that's probably because you're not holding a Pixel phone in your hand. Even my Nexus 6P on 7.1.1 (0.0.1 higher than the Pixels' software version!) 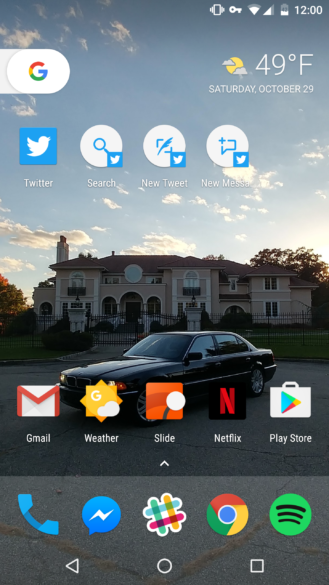 with the Pixel Launcher can't display it; however, some launchers may be able to. The screenshot above is courtesy of Liam and his Pixel XL, or as he calls it, "Pixelixel." The alpha also adds support for Nougat's implementation of multi-window. This was an odd omission, considering the Twitter app has worked with Samsung's multi-window for a while now, but it's finally here. Yes, it could previously be enabled via developer options, but official support means that it's bound to be less clunky. Interesting choice of icon for bug reporting, Twitter. Want to download this update from the Play Store? Unless you're already in Twitter's alpha program (which I somehow enrolled myself into), you can't - officially. Since we're nice people, we've taken the liberty of uploading both 32-bit and 64-bit variants to APKMirror. 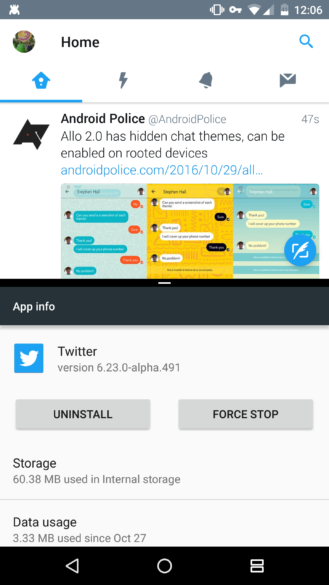 Please note that if you do install this (or any) Twitter alpha, you'll get a persistent bug report notification whenever Twitter is open. It seems like it can only be disabled by disabling Twitter notifications altogether.